Santa Barbara Greenhouses have been around since the 1970s. Unfortunately it looks as if their website has not been updated since then. We only point though out because it looks as if you're looking to purchase a website online, hense doing an online review search. But now we can talk about the greenhouses themselves. Santa Barbara Greenhouses might not have many different designs, but they cover the needs with the few they have. Santa Barbara Greenhousse come in Deluxe (Wood) and Montecito (Aluminum). They offer a 4mm or 6mm (Polycarbonate) plasitc and various accessories. Though their quality is up to par, the prices might knock you back a bit. 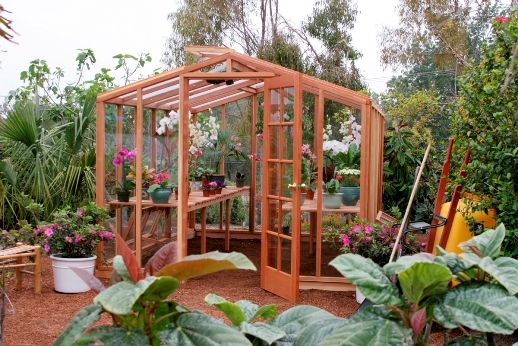 If you're looking for wood you might also wish to consider the Sunshine Greenhouse models. Pricewise they make more sense. We don't have many other complaints for the Santa Barbara's other than that. Sizes start at 7x4 and go up to 15x32 so you should find exactly the size you're looking for. But at that size you're looking well over 20k.